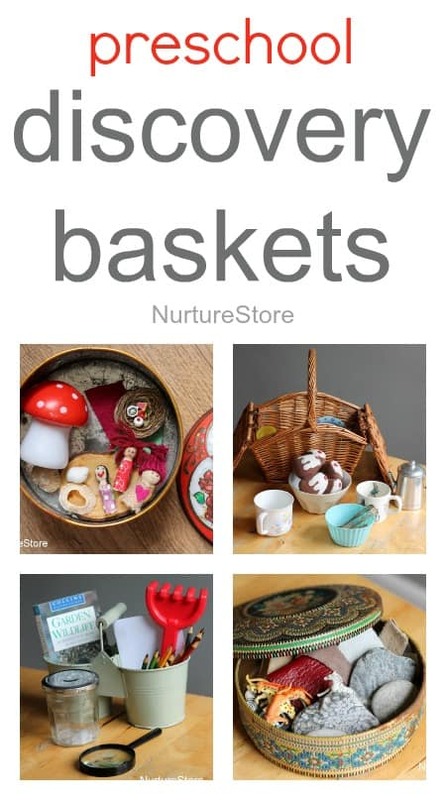 Following on from our article on how to make discovery baskets for baby and toddlers, here’s the preschool edition. 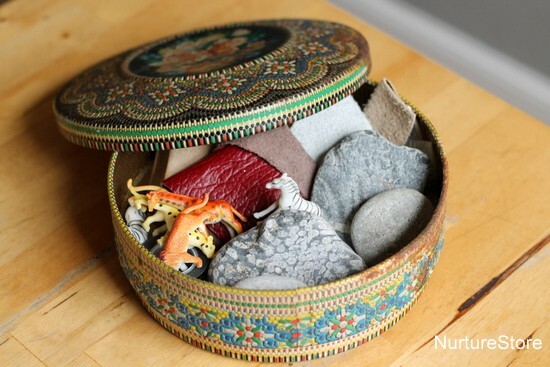 As before, take a container of your choice and fill it with a small collection of items, based around a theme. The idea is to give your preschoolers an encouraging prompt: a gentle invitation to dig in, discover some new materials, and then to use their own ideas to take the learning on. We like to use a basket with a lid, so the contents are hidden for some ‘guess what’s inside this week?’ fun. 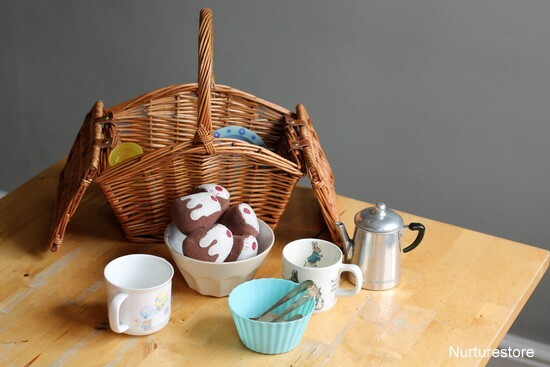 If you’ve followed along with the Simple Play :: complex learning series, you’ll know I’m a big believer in classic, simple play ideas – and an invitation to host a pretend play tea party is perfect. All you need is a few items to get things started, and then children are off and playing and imagining. Listen in to the language they use as they play, accept a cup of tea, and sit back and observe the ideas the children bring to the game. 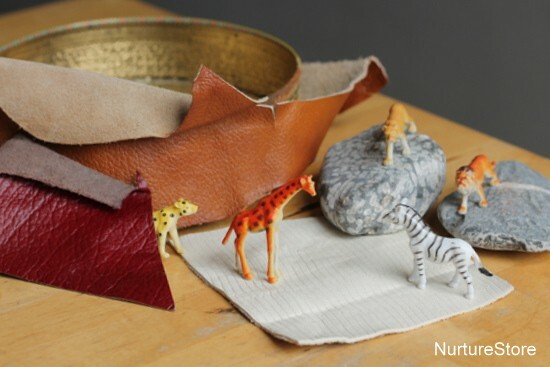 Gather together a set of materials that prompt some maths play. 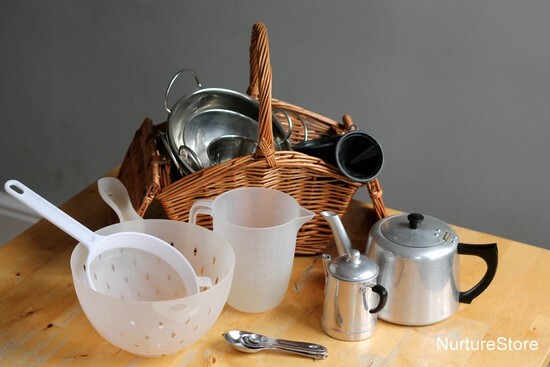 In this basket we have items on the theme of volume, and it can be paired with either water or sand for children to discover the potential in the materials. I like to offer the materials and step back, to allow the children to play, experiment and ponder, rather than trying to teach the lesson, for example, that a big jug holds more water than small jug. If you sit nearby you can observe their play, pick up on discoveries they’ve made, over hear questions they are posing. A group of children may well answer questions for each other. You might use a wonder wall to record their questions, and then set up another time to go back and work on the questions they still have. We do want to review and extract the learning from what the children are doing, but first of all, let them play. This is one of my children’s favourite discovery baskets. 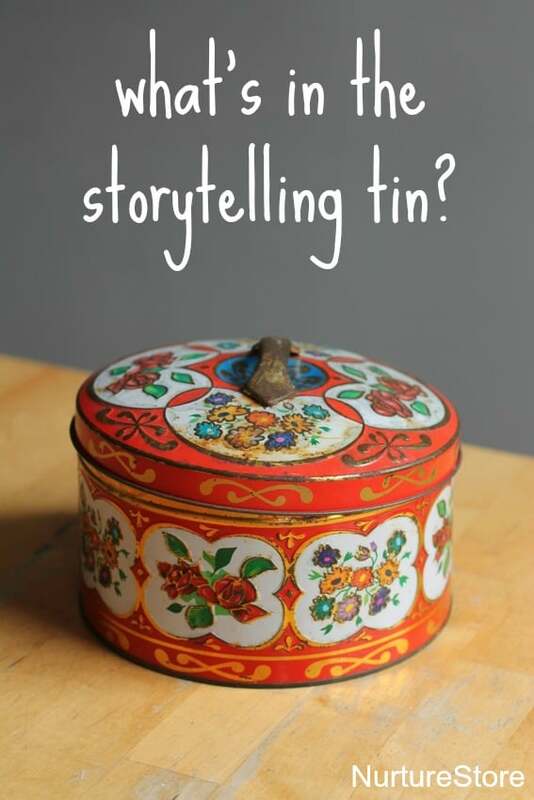 I use this lovely vintage biscuit tin as our storytelling tin. What’s inside today? There’s a story waiting within, ready to be told. Open the lid and see who’s come to play! But of course you can gather together any variation of loose parts and character, perhaps to match a book you are reading. 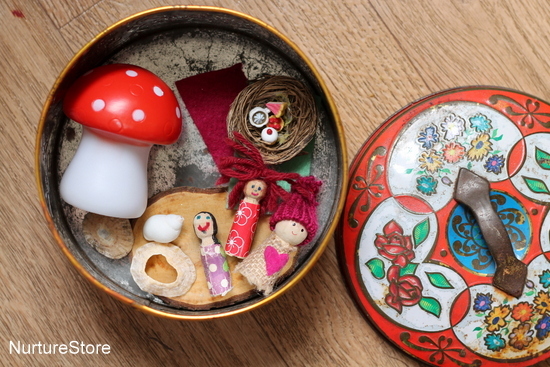 Open up the lid and invite the children to tell a story with the contents. My daughter likes to play this on a big roll of paper or on a white board laid on the table, so she can also draw in a map or landscape for the story. 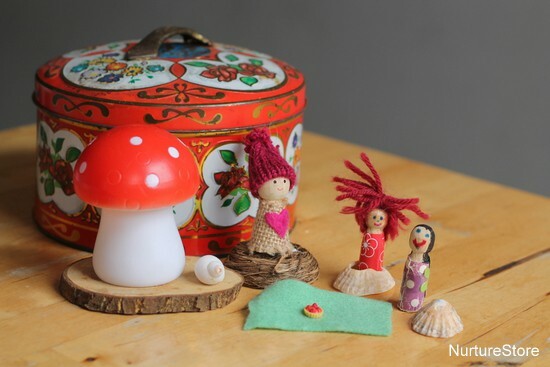 In the same way we used the storytelling tin, we can also use a container to hold the elements of a small world. A small world is a miniature play scene, where children can use their imagination to direct the characters. Often we match the contents of the tin to a theme we are learning about in science, history or geography. Although it’s temping – and fun! – to set out a small world for our children, this discovery basket idea hands all the creating over to the children, allowing them to both build the world and play in it. It’s a pleasure to share them! Love these thank you.Wish my son was still young .But Im going to make some of these for school .Im special ed aide these will be so much fun in PATCH and CATCH . Thanks Belki. Hope your school children enjoy them. Long time follower and first time commenting! I love your ideas for children. I’m a retired preschool teacher and miss my job so i like to keep up with ideas! The discovery/ story tins are a wonderful idea! Love it. Thanks for posting. Hi Susan! It’s lovely to hear from you Thanks for reading along. 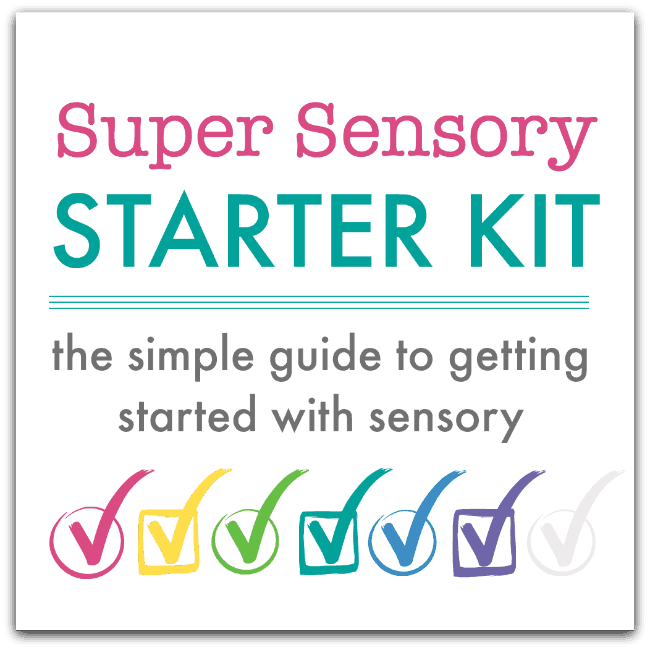 I have pinned this to our Pinterest pages for early educators and also for language.It’s a great post to encourage imagination and language-many thanks. Thanks very much for sharing it on Sue.